The main club run is at 7.30pm on a Wednesday. You can Find us at The Nevill Ground, off Warwick Park, Tunbridge Wells. Take a look at our Training section to see when we run and our club in pictures above to see what we get up to. The Join us section contains our small annual fee and the many benefits of running with the Tunbridge Wells Harriers. The Harriers’ headquarters is at the Nevill Ground off Warwick Park in Tunbridge Wells, Kent, TN2 5ES. The ground is at the end of Nevill Gate, off Warwick Park – upstairs in the pavilion. We are changing the start of our membership year to April from 2020, so these values reflect a 12 month membership until then. The benefits of joining the Harriers as a member are listed below. Too slow, too busy, too old? We have runners of all speeds. If you can comfortably manage five miles in under an hour, you’ll be fine, otherwise find out about our beginners group run by one of our former members. You’re welcome to attend as many or as few sessions as you like – no-one will be counting. Our oldest member is in his 80s, a number are well into their 70s and quite frankly, 60 is the new 50! All these members run regularly on a Wednesday night and still compete for the club. We’ll make sure you’ve got someone to run with when you first start and that you get to meet the regulars. Come along to a Wednesday club run and try it out. You can run with us for three sessions before you decide. Meet us at the Nevill Cricket Ground Pavilion, off Warwick Park Road, at 7:20pm and ask for Andy Howey (Chairman), Dave Hadaway (New members) or any other friendly Harrier. After the run there are ladies and gents changing rooms with hot showers, and many people stay for a drink and chat in the bar. We look forward to meeting you, but in the meantime if you have any questions, drop us a line. Whether you’re looking for an early morning mudfest or a sociable evening canter, there’s a Harriers training session to suit. The following runs are organised each week, but if they don’t fit the bill, there will almost certainly be other members out and about with whom you can link up. If you’re not ready for these distances yet, take a look at the beginners group, Sarah’s Runners. At Rusthall Church Hall (right of the One Stop) or outside on Rusthall cricket pitch when the weather is fine. 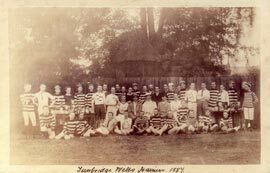 Although a club called Tunbridge Wells Harriers was founded in the late 19th century and existed until the 1930s, the origins of the current club may be traced back to the running boom of the early 1980s. The club staged its first half marathon in January 1983, with 53 runners using a variation on the current course with a start near the Wellington Hotel. The club membership continued to grow, and the difficulties that this brought about at the Cross Keys necessitated a change in venue. In 1985, the club moved to the Tunbridge Wells Borderers Sports Club – the purpose-built pavilion at St Marks Recreation Ground on the Frant Road used by the Tunbridge Wells Rugby Club and the Borderers Cricket Club. As the club developed, so its range of activities changed, and cross country, track and field, and triathlon were added to the Club’s origins in road running. The Half Marathon continues to grow in size and stature, with the increase in field to a now sell-out 2500 entrants. The event, a recognised ‘pre-London’ race in February, has hosted the Kent Championships, South East Athletic Association Half Marathon Championships, and has raised tens of thousands of pounds for charity. The race won the the ‘most improved event’ award at the Runner’s World 2009 awards. In addition to the Half Marathon, the club has an excellent record in the hosting of cross country events, with inter-club events, league meetings, county championships and the British Veterans Championships all having been promoted by the Club. Each September the club organises The Eridge Park 10 Trail Challenge, a favourite of off-road runners through an historic deer park and ancient woodland. In 2009 the race came 1st in the Runner’s World UK’s Best 50 Races of 2009 listing, and in 2010 was honoured to be hailed as the ‘Best Race in the World’ by the Observer newspaper. 1997 saw members voting to change the name of the Club from Tunbridge Wells Runners to Tunbridge Wells Harriers. The name change was but a small part of a development plan that has taken the Harriers further into this century with as much success as the original Harriers had in the last. Recent success has included the men’s road running team winning the Kent Grand Prix in 2008 and 2009. In 2006, the club moved to a new base at the Nevill Ground off Warwick Park, sharing facilities with Tunbridge Wells Cricket and Hockey clubs, providing improved facilities for the growing number of Harriers running each week. The club now has over 200 members over the full range of abilities.